I mentioned in that post that in between the two phases of that kitchen remodel we also did their master bathroom. Well, today I’m excited to share the end results of that project! Overall, this bathroom was dated, had a few leaks, and felt tight and confined. But there was one area where there was an abundance of space — look up…. Those high ceilings were going unnoticed! Look at all of that unused space up there. It's about time those high ceilings were given some attention! My challenge was to stay true to their style of a greige-toned space with an up to date but rustic look and make the bathroom seem larger and more luxurious. If this isn’t a best case scenario for installing a free-standing tub to help your bathroom feel larger, I don’t know what is. We laid a 5’ tub on top of a gorgeous brushed limestone floor — it’s tight (we only have inches to spare), but it’s sooooo effective. Whitewashed oak cabinetry that went up — almost to the ceiling — to draw your eye upwards and make the room feel grander. They got more built- in storage in the cabinets, along with side medicine cabinets. And the center tall tower accentuates the height of the space, as do the tall mirrors. All those vertical elements do their thing, you know — they draw your attention to all of the underappreciated space that's above eye-level. White Calacatta marble softened the room with tumbled marble tile on the walls and brushed limestone on the floors, providing the rustic feel they love. Dark bronze fixtures and hardware added some definition and punch, which worked beautifully with our style. 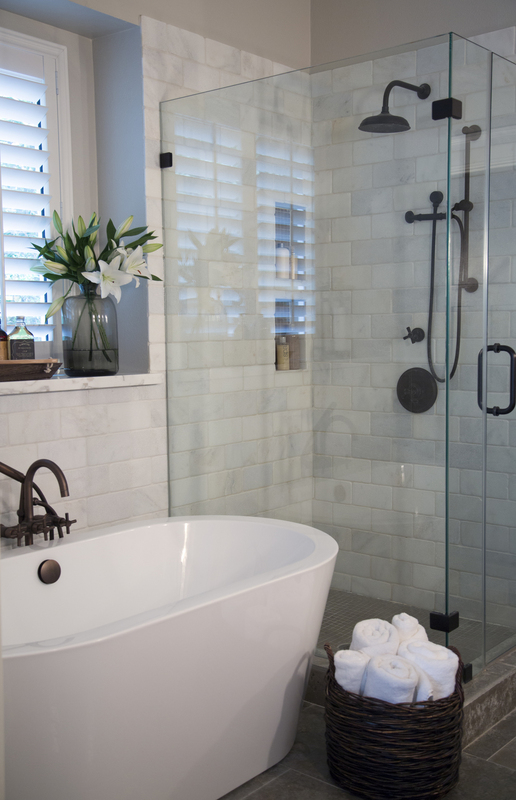 A Confined Bathroom Is Uplifted with Bountiful Space! Enter your name and email address for a list of sources for this bathroom. The link will pop up right here. Thank you! Here's your link to the source list. Want To Hire An Interior Designer? Here's How We Manage Our Intake Of Clients.